Datacard 503850-401 laminate (also referred to as overlamination) provides a layer of protection over your printed cards, making them more durable and providing protection from wear and fading. Datacard 503850-401 laminate is perfect for smart cards providing maximum overlamination with a smart chip panel cut-out. A printer with lamination capability is needed in order to use Datacard 503850-401 overlamination. 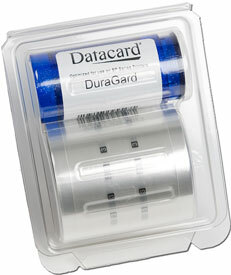 Datacard recommends using genuine Datacard supplies to ensure the best performance form your Datacard ID printer.